History has witnessed the coming and going of many great civilisations. Through its long history, the Hindu civilisation has endured numerous attacks and attempts at its destruction. However, it has also produced a long line of heroes and warriors to rise up and protect their motherland from the fate of every other ancient civilisation. Baji Rao Peshwa was one of the greatest warriors and protectors of Hindu Dharma in the History of Bharat in the 18th century. The rebirth of Hindu polity after the Vijainaygar Kingdom under the nomenclature of Hindu Pad Padshahi, well founded by Chatrapati Shivaji Maharaj, attained shape during the ascendency of the Peshwas. 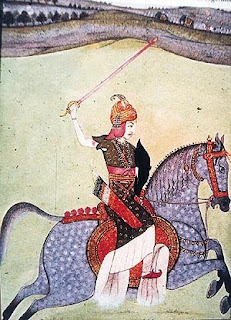 Expert swordsman, outstanding rider, master strategist and leader by example, Baji Rao I succeeded his father as Peshwa when he was only twenty years of age…launching into an illustrious military career that occupies its own special place in the history of Hindustan. Peshwa Baji Rao, the great Maratha general and statesman, changed the map of India in the mid-eighteenth century. His military campaigns were classic examples of his genius. In the havoc of the religious intolerance continued by the tottering Mughals after Aurangzeb, Baji Rao stood out as the champion of Hinduism as he protected Hindu Dharma from the onslaught of Islamic rulers. It was he who expanded the Hindu Kingdom beyond Maharashtra across the Vindhyas and got it recognised in Delhi, the capital of the Mughals who kept Bharat (India) under their rule for many hundred years. The Hindu Kingdom created by its founder, Shivaji, and later expanded by Bajirao reached its peak during his son’s reign twenty years after his death. After driving the Afghans out of the Punjab, they raised the saffron flag of Hindus not just on the walls of Attock, but even beyond. Baji Rao is thus acknowledged as one of the greatest warriors of Hindu Dharma and the most famous ruler in the history of Bharat. He was a noted general who served as Peshwa (Prime Minister) to the fourth Chhatrapati (Emperor) Shahu. Baji was born on August 18, 1700, as the eldest son of Peshwa Balaji Vishwanath Rao who had taken the Peshwaship to a new height. He belonged to the reputed, traditional Chit-Pawan Brahmin family of Konkan. Balaji Vishwanath (Father of Baji Rao), though third among the Peshwas, had overtaken his predecessors as far as his achievements were concerned. On April 2, 1719, Peshwa Balaji Vishwanath breathed his last. The Satara royal court, nay, different Maratha power agglomerations were humming with only one question-would Bajirao the son of the deceased Peshwa, just 19, devoid of experience, be suitable for the supreme post ? There was criticism against deciding on a person so young. Maharaja Shahu a great jeweller of human qualities, made no delay in answering this question. He immediately announced the appointment of Bajirao as the new Peshwa. The announcement was soon translated into a royal function. It was April 17, 1719, when Bajirao was ordained with the regal formalities. He was entrusted with the high honorable post much more because of stout mental and physical constitutions clumped with his political sagacity rather than due to conventional hereditary or reward against the great services rendered by the late Peshwa. Still a number of nobles and ministers were unable to hide their jealousy towards Bajirao. Bajirao, however, hardly spared any opportunity to justify the decision of the King and thereby deftly shut the mouths of his rivals. Bajirao soon realised that the feudalistic forces had a tendency towards segmentation and that the honour of the kingship required determined deterrence to the centrifugal forces. Then alone the expansion of the Hindu Pad Padshahi could be ascertained. Bajirao's realistic insight was phenomenal. He was quite aware of his inimical surroundings. Nizam, the governor of Mughal Sultan, the vexatious terrorist Siddi of Janjira and the bugbear Portuguese along with internal rivals demanded his immediate commanding performance for the sake of the security of the Hindu Kingdom on which was based the volume of expansion of Hindu Pad Padshahi across the Vindhyas in the north. Bajirao believed that if the lofty dream of Shivaji Maharaj for a Hindavi Swarajya or “Hindupad Padshahi” as he called it was to be achieved, the two Maratha factions of Satara and Kolhapur had to come together. When Baji Rao realized that this was unacceptable to the Kolhapur faction, he decided to achieve his objectives without their help. To accomplish his dream of Hindavi Swarajya (Hindu Kingdom) Bajirao’s brain was working faster than anything else and finally he decided to put forth his thoughts in the court (darbar) of Chatrapati Shahu. Standing tall, poised and confident before Shahu Maharaj and his court, the young new Peshwa Baji Rao is said to have thundered, “Let us transcend the barren Deccan and conquer central India. The Mughals have become weak, insolent, womanizers and opium-addicts. The accumulated wealth of centuries in the vaults of the north, can be ours. It is time to drive from the holy land of Bharatvarsha the outcastes and the barbarians. Let us throw them back over the Himalayas, back to where they came from. The saffron flag must fly from the Krishna to the Indus. Hindustan is ours”. The members of the court (Pratinidhi) opposed the idea and suggested that they should first consolidate in the Deccan but Baji Rao insisted on his original plan. He fixed his piercing gaze on Shahu Maharaj and said, “Strike, strike at the trunk and the branches will fall off themselves. Listen but to my counsel and I shall plant the saffron flag on the walls of Attock”. Chatrapati Shahu was deeply impressed and exclaimed, “By heaven, you shall plant it on the Himalayas” and permitted the warrior Peshwa to lead the armies and launch forth. This story itself indicates the vision of Bajirao and Shahu Maharaj's faith in the young man. Shahu Maharaj appointed him as a Peshwa at such a tender age, recognising his talents and entrusting to him imperial troops which had recently emerged victorious in the Mughal-Maratha conflict which ended in 1707. Baji Rao's greatness lies in that true judgment of his master and the seasoned troops at his disposal. Thus his conquests brought on a feeling of terror towards the Maratha armies in the sub-continent of Bharat (India). He then embarked on a ceaseless twenty year campaign in a strike northwards, every year inching nearer to Delhi and towards the extinction of the Mughal Empire. It is said that the Mughal emperor was in such terror that they refused a meeting with Baji Rao, fearing to even sit in his presence. The holy pilgrimage routes of the Hindus from Mathura, to Benares to Somnath were made free of harassment. Bajirao's first campaign in the north-west started from 1723 with the victory of Malwa followed by Gujarat. Baji Rao conquered Gujarat and most of central India and even shook the foundations of the Mughal Empire by attacking imperial Delhi. It was he who really went ahead and occupied many Mughal provinces right under their nose. Bajirao's political wisdom stands out in his Rajput policy. He sought to avoid confrontation with the Rajput houses, the ex-supporters of the Mughal rule, and opened a new era of friendly relations between the Marathas and Rajputs. To name the houses were Bundi, Amer, Doogargarh, Udaipur, Jaipur, Jodhpur, etc. Visualising the danger lurking dangerously close to Delhi, the Sultan called for the help of the once vanquished Nizam. Bajirao again raised him to the ground. This wielded considerable influence of Bajirao over the Delhi court. Bajirao's, crowning success was the defeat of Bungash Khan, near Mahoba, who was regarded as the bravest commander of the Mughal army, while he was busy bullying the old Hindu King of Bundelkhand. This act of military assistance provided by Bajirao made Chhatrasal feel passionately indebted to him forever. He moved the administrative capital of the Maratha Empire from Satara to the new city of Pune in 1728 with the permission of his master. The Kingdoms of Scindias (Ranoji Shinde) of Gwalior, Holkars (Malharrao) of Indore, Gaekwads(Pilaji) of Baroda, and Pawars (Udaiji) of Dhar were Baji Rao's creation of a Maratha confederacy as he wreaked havoc on the disintegrating Mughal Empire and set up his jagirdars (fiefdoms). The greatest of the warriors of the empire, Mughal, Pathan and Central Asian alike were defeated by Baji Rao: Nizam ul Mulk, Khan I Dauran, Muhammad Khan are but a few of the names of the warriors who failed before the Marathas. The Battles of Bhopal, Palkhed, the victories over the Portuguese invaders in Western India are amongst his great achievements. Baji Rao fought over 41 battles and is reputed to have never lost one. He is one of the three Generals in world history who never lost a battle. He is often compared with Napoleon Bonaparte by many great historians. His first encounter, the Battle of Palkhed was a good example of his innovative warfare tactics. Looking back at this battle one is compelled to admire him. His battle with the Nizam at Bhopal is known to be a masterpiece of tactical war strategy and maturity of political view. A brilliant military tactician, a born leader and a brave soldier; in every possible, sense he was the true torchbearer of Chhatrpati Shivaji's dream.